Perched on a cliff, the Blooming Bay Clifftop Resort in Varkala offers sweeping views of the sea, and is perfect for when you are in need of a relaxing holiday. Plus, budget travellers won’t complain too much about the prices, especially if you make a trip during the monsoon season. Varkala is possibly one of the few places in Kerala where the beaches are lined by steep, brick-red cliffs. This unique feature has made it a huge hit with tourists. The relatively quiet Aliyirakkam beach in Varkala, is also bordered by these gorgeous cliffs. And on top of one of these, amidst thick coconut groves, sits the Blooming Bay Resort. The resort has a handful of rooms and cottages. You can choose between basic rooms (with or without AC) that come with comfortable beds and cottages and provide breathtaking views of the sea, or the pricier rooms and the honeymoon suite. These come with small balconies where you spend a day reading, catch the sunset or sunrise, and generally laze about. Even in peak season (between December and January), Blooming Bay won’t feel heavy on your pockets, but if you’re looking to save a penny or two, we recommend that you visit between April and September, when the rates are reduced considerably. Aiming for a holiday where you can relax like there’s no tomorrow? You’ve come to the right place. At the very edge of the resort, there are thatched gazebos where you can stretch your legs and bask in the warm sunshine. Leisurely strolls on the unspoiled beach below are also recommended. 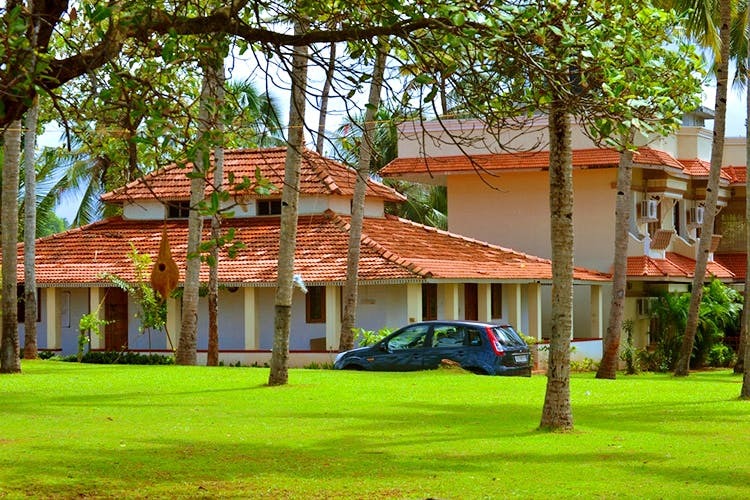 And of course, no trip to Kerala can be counted complete without a dose of Ayurveda and yoga: The resort has a spa where you can rid yourself of ailments and stress. Yoga classes are conducted too, if booked in advance. Priced INR 2,500 upwards, this makes for a trip that'll be worth your time. If you need to pick up the pace a bit, we recommend that you hike down to the beach and sign up for parasailing, scuba diving or paragliding. We also recommend a trip to the nearby town of Kappil where a lake meets the Arabian Sea right at the beach. It makes for a stunning view and is worth the short drive from the resort.